This season, winter has decided to come later in Scotland. I didn’t have enough patience to wait as I was eager to go out so plan B came in play. Would have liked to head to Cogne but couldn’t find anybody to join me for the full 5 days. 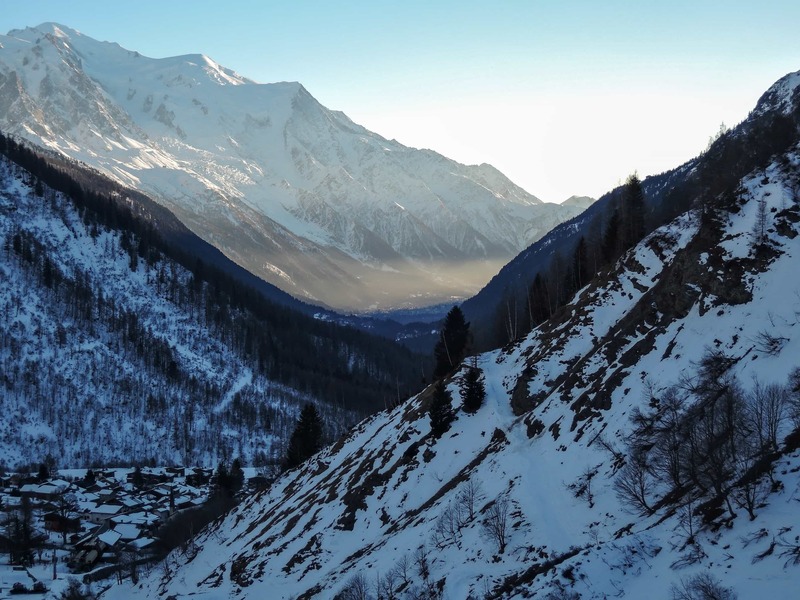 I always enjoy going back to Chamonix though so that became the obvious choice. But if I were to judge by the temperature down in the valley for sure 15+C is not a winter weather. Nevertheless up in the mountains there’re still good conditions. A bit concerned about the avalanche risk, I packed and took the plane to Geneva. I however didn’t manage to follow my plan as the plane delay and the “no show” of a Easybus van set me back with about 4 hours. Needless to say that I will never book with them if I’ll ever find myself there during the ski season. From all the shuttle services seems like just Easybus was stuck in traffic. When eventually the next one came, the driver took 2 30 minutes brakes for a 2 hour drive. 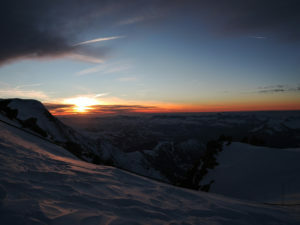 12 hours later after leaving my home I was at last in Chamonix. As usual, I spend the nights at Gite Le Belvedere in Argentière which adds another half an hour to the journey. I dropped my bags, changed and decided to acclimatise as much as I can heading towards Col de Balme. Had a nice lunch and went back. In the evening I met with Christian Kober, who is organising the Snow Leopard Expedition next year and Joe, with whom I was going to climb in the next days. 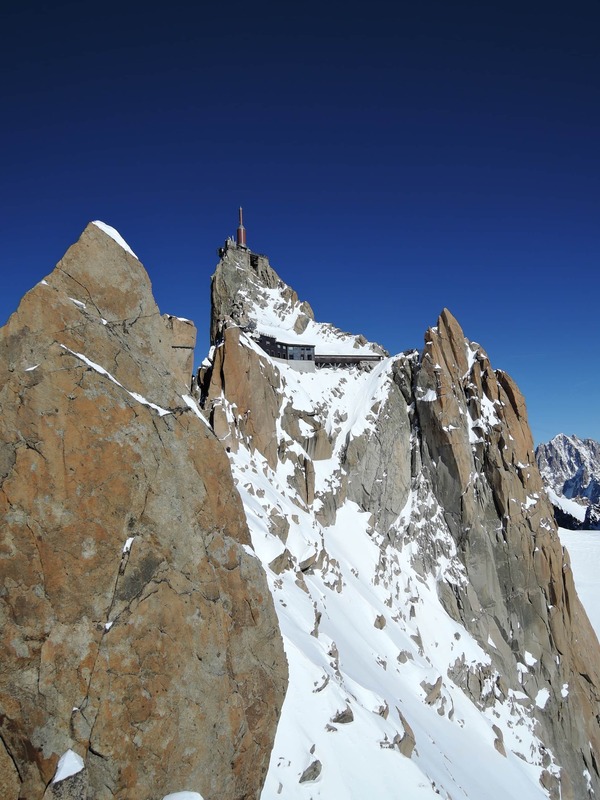 As the decision was made to go up to Aiguille du Midi, warm up on an easier route then depending on weather try something harder, we got the first cable car and head to Cosmique hut. From the top station, take the tunnel to exit and descend via the snow ridge. At first the path is clearly marked and secured by rope. After this section turn right and down into the glacier with the South face of Midi on your right. Rope is not needed but extra care as the slope can be steep depending on the amount of snow. Keep right and up to the hut which you should have seen already – 40 min. 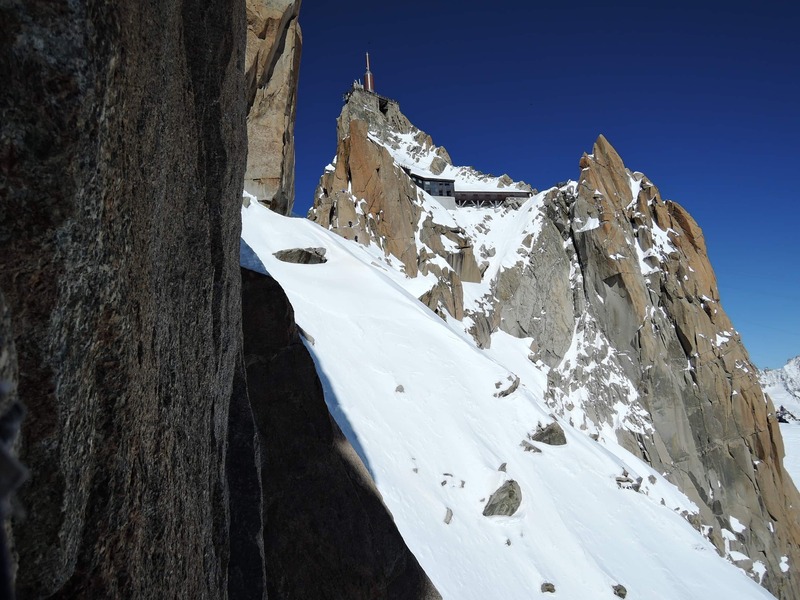 We left most of our gear at the hut and set off for the Arete des Cosmique. If you plan to go down in the valley, make sure you get in time for the last lift. Otherwise repeat the approach and spend the night in the Cosmique hut. Blankets are provided but the wind blows inside by the window. it was quite warm inside though and not needed a sleeping bag. You can bivouac nearby if you want to save the cash. 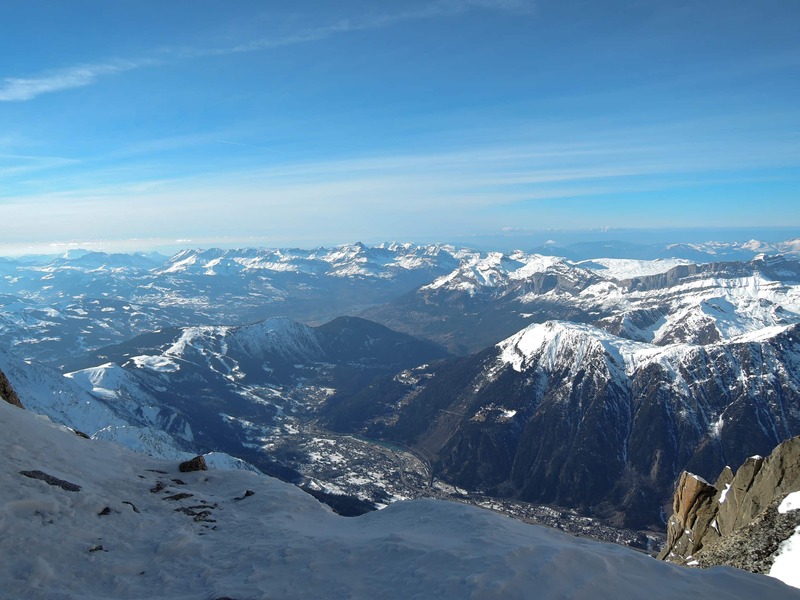 Cosmique hut : 42 euro- night / 65 euro for half board / 6euro for 1.5L water bottle. We set our alarms for early morning, but it wasn’t until 9am that we left the hut. Nothing left behind as the plan was to catch the last cable car down to the valley. So the packs were quite heavy. We split the gear and head out. Clear sky but cold and very windy so I kept my belay jacket on. The route is visible from the refuge and so are the other groups. 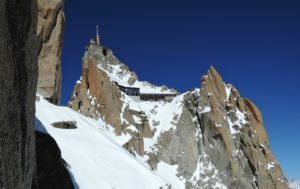 So it is advisable to leave the hut before the first cable car arrives as the route can become crowded. Retrace the steps towards the Midi stations for 5 minutes, then turn right and cross Col du Midi plateau having the Triangle as a point of reference. You can’t miss it as it’s literally a massive rock face in a triangle shape. As you get closer, make your way to the right and find a secure bridge to cross the bergschround. It can vary from year to year so you might have to slightly adjust your itinerary. Is always good to stay roped. If the winds are high, foot trails can be covered almost instantly. There are about 8 major lines but if you aim for Chere, head for the last one. As you get closer to the face, the start of the couloir only becomes visible when you get to the bottom of it. It starts wide but after the first pitch ques can form so is good to move fast. The climb starts with a 45° snow slope until a belay is reached on the left side, right at the bottom of the face. 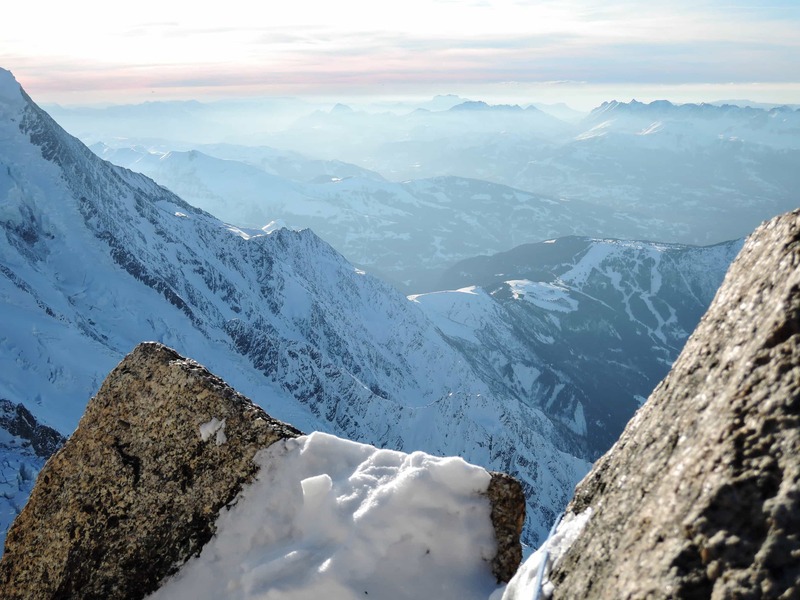 No protection is needed so far but extra care as you are climbing above a massive crevasse. A fall here will only end up with you at the bottom of it. The 1st 35m pitch starts from the belay point with a slightly steeper slope to reach another belay on the right. Should be straight forward with no protection needed. Bring your partner and get out the second rope. A twin 50m pair should be sufficient. The 2nd pitch is longer, 50m, and steeper. Depending on the conditions the gully can be ice up to 70° or a mixed grade III. The last one means climbing a few tricky steps before reaching the ice. There are a few slings and pegs on the right side but always test them and back it up with your own gear. 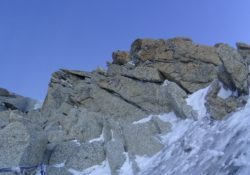 The gully leads to the crux pitch and a comfortable belay ledge. 3rd pitch is the hardest of all. 40m of 85° ice, often hard and black. Sharp ice screws will do the job and keep you safe. By this time other parties would start their descend so be aware of the climbers abseiling on top of you. 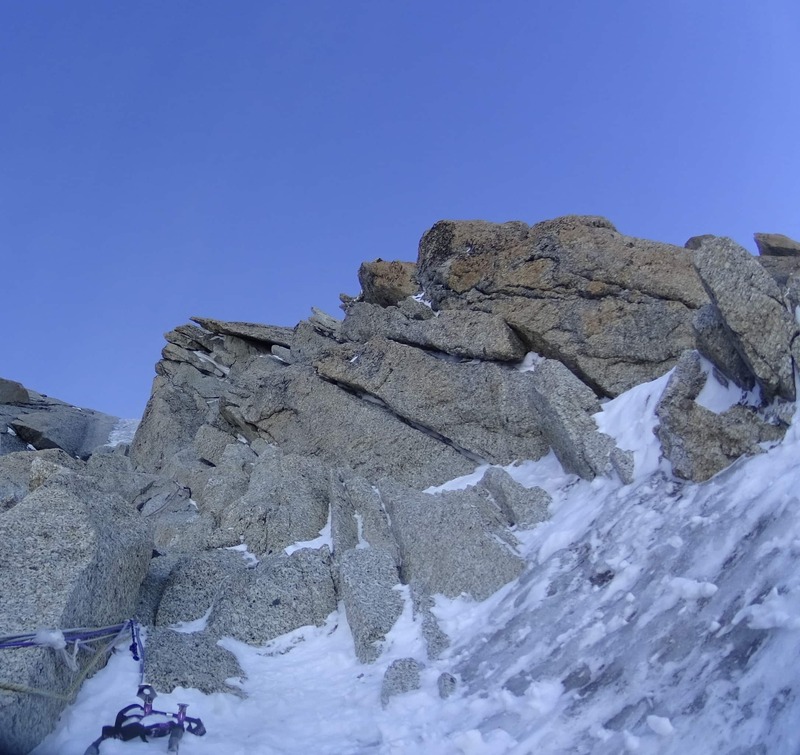 The last 35m of ice make the 4th and final pitch of the route. The slope lowers its angle as you make your way to the top. Most of the parties stop here and abseil. 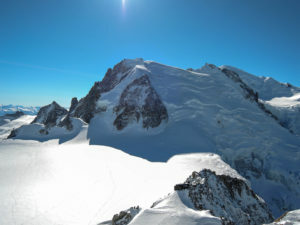 If you wish to continue, you’ll be facing a mixed ground of rock and snow to the top of the Triangle and more snow for Tacul. Be aware of the possible seracs and cornices. From the 2nd belay point on the right, you can abseil straight on the plateau. 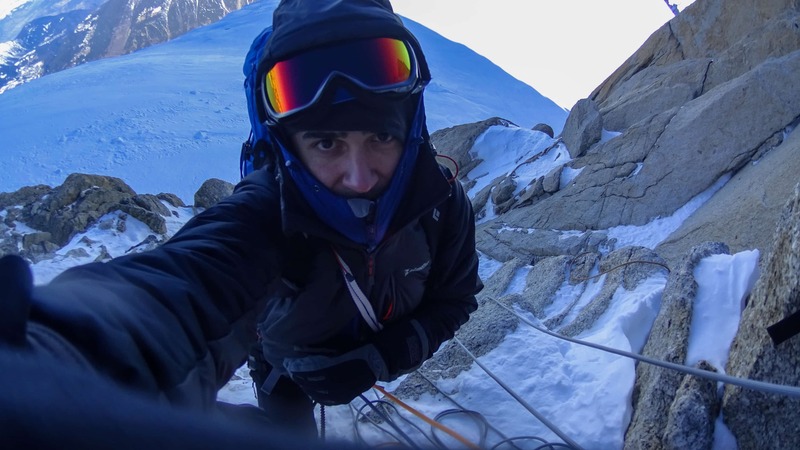 Make sure your rope is long enough, otherwise you’ll find yourself dangling above a massive crevasse. Total time should be anywhere between 3 to 6 hours. You should take in consideration factors as weather and route conditions. As a classic is one of the busiest routes in Chamonix and queuing up means more time. If you wish to return to the hut, then retrace your steps. Alternatively you can go for the cable car. Keep in mind when does the last one leave as we missed it by just 10 minutes. 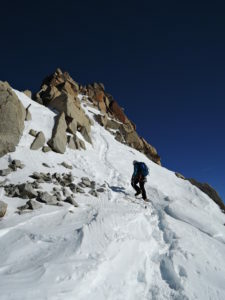 Crossing the plateau can be exhausting as the high winds can add up to 50cm of extra snow. we were knee deep racing to get the last lift down. Luckily the staff saw us just under the last ridge and they waited. We couldn’t have been more grateful as sleeping in the toilets would have been a cold and restless night without a sleeping bag. Before you leave, make sure you have plenty of water, some energy bars, 2 x 50m ropes, a few sharp screws, some nuts, friends and bunch of quick draws. And of course ice axes. You’ll be climbing in the shadow of the Tacul so it’s less wind, but cold. Belay jacket was always on and so were my double OD Arete gloves. At the second belay I had to put my arms under my armpits as they were solid frozen and in pain. The most important thing, have a partner that you climbed before with and are confident in your communication system in case you can’t hear/see each other. We bailed after the 3rd pitch as Joe took a fall due to miscommunication. Luckily he only had a small injury at his shoulder but could have ended much worse. Should probably invest in a walkie talkie system for the future. It was a great climb and one day I will sure return to finish what I’ve started.